(PRESS RELEASE) His Excellency The Governor-General Sir S. W. Tapley Seaton, GCMG, CVO, QC, JP., this afternoon (Friday) received a courtesy call from His Excellency Muhammad Lutfi Special Envoy of the President of the Republic of Indonesia. This is His Excellency’s first visit to the Federation. The Special Envoy is accompanied by His Excellency Priyo Iswanto, Ambassador of the Republic of Indonesia to Saint Kitts and Nevis resident in Bogota, Columbia and three other members of staff of the Ministry of Foreign Affairs of Indonesia. 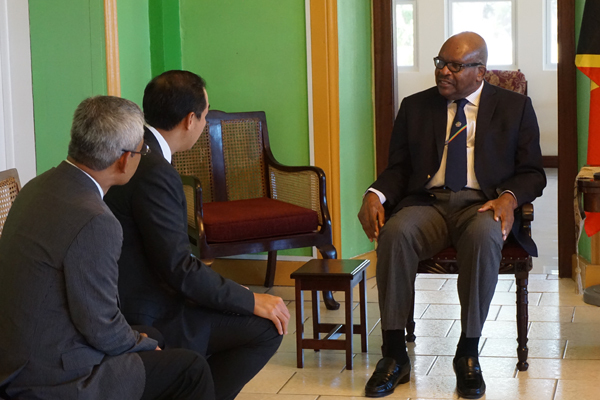 The purpose of the visit is to strengthen the bilateral relations between Indonesia and Saint Kitts and Nevis and one of the matters accorded priority is the issue of the impact of climate change in our island nations and other matters of international importance. The delegation will pay courtesy calls on the Honourable Prime Minister, the Honourable Minister of Foreign Affairs, the Chamber of Industry and Commerce and the St. Kitts Investment Promotion Agency.